Vegetarian food made easy and (mostly) healthy. 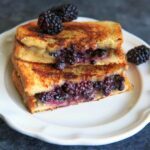 Blackberry Brie Grilled Cheese Sandwich – perfect for the end of summer or early Fall! This sweet and savory combo gives a fun twist on the classic. On the heels of those lavender cookies, I bring you another blackberry treat. To think, I used to not like blackberries! And we all know I like to put fruit in everything. Why not a sandwich? So I swapped the blueberries for blackberries, and had the perfect amount of brie to use up! It was meant to be. This recipe is not exactly one of the healthier ones, but it’s comfort food at its finest. Plus a serving of fruit counts for something, right? Brie is a favorite of mine for grilled cheeses (as evidenced in this “grown up” version). ALSO I learned a new trick for making grilled cheese sandwiches even better – butter BOTH sides and grill one side before putting the fillings in. Tip from chef Adam Kuban. 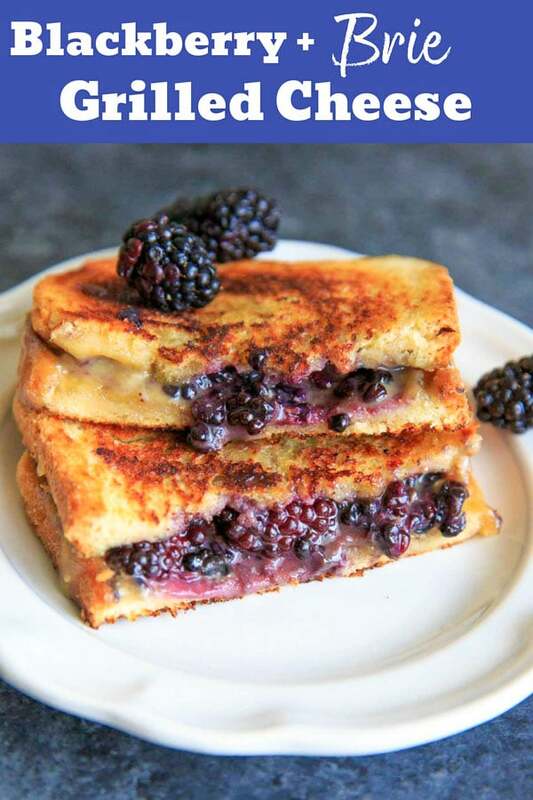 You can keep it simple and just use blackberries and brie cheese, or you can get fancy and drizzle a little honey and/or cinnamon on for a little extra sweetness. The recipe measurements are just a guideline, go ahead and stuff that sandwich to your hearts content! 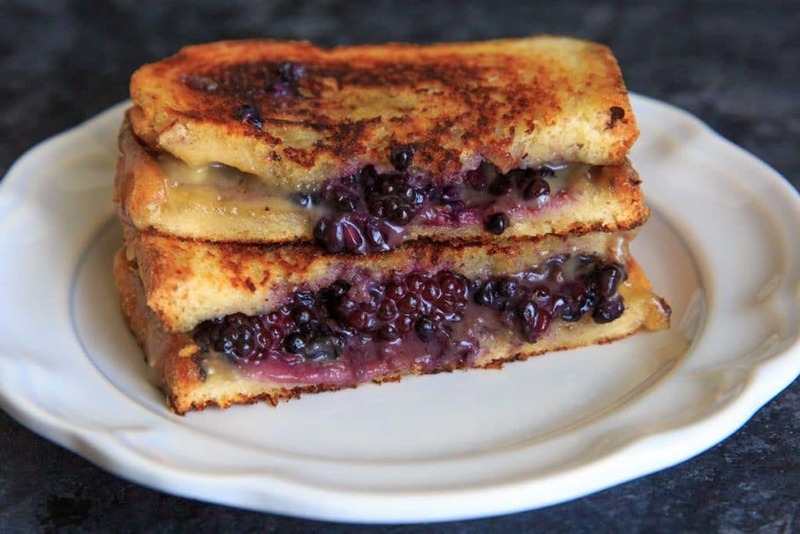 Have you ever added blackberries or fruit to your grilled cheese? Tell me in the comments! 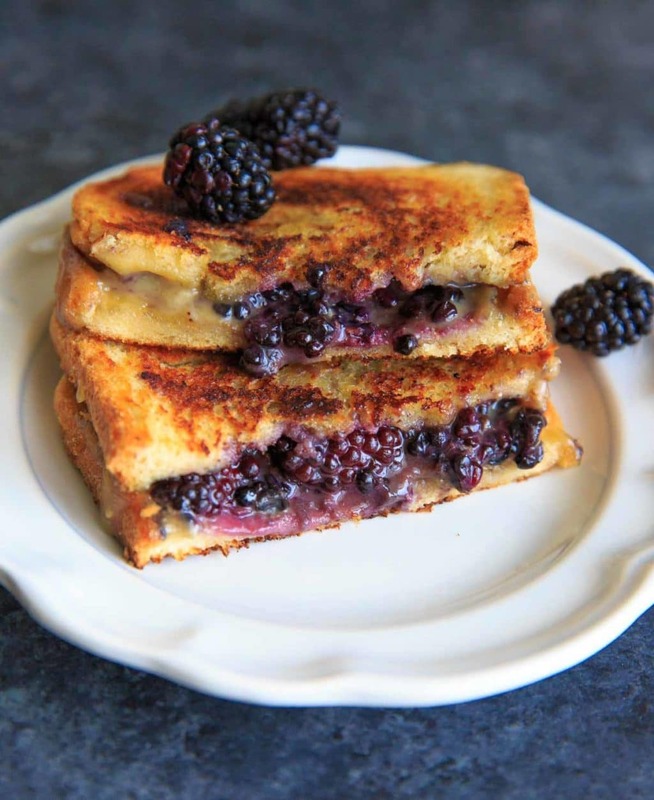 Blackberry Brie Grilled Cheese Sandwich - perfect for the end of summer or early Fall! This sweet and savory combo gives a fun twist on the classic. Butter both sides of sandwich bread and place on a warmed cast iron skillet or griddle (or similar). Cook over medium heat for 2-3 minutes or until lightly browned, and then flip each slice. 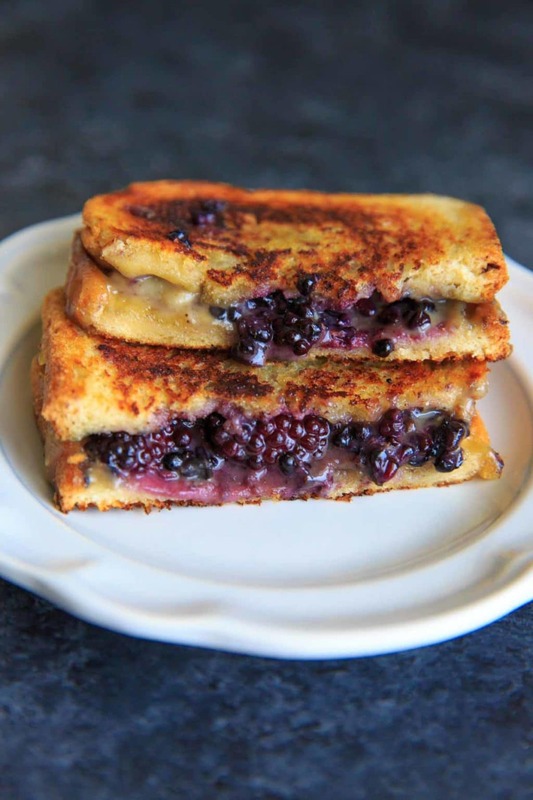 Place brie cheese and blackberry slices on one piece of bread (the cooked side). Option to drizzle with honey and/or sprinkle cinnamon on top. Place the other piece of bread on top of blackberries (browned side down). Cook until cheese is melted and both sides of sandwich are lightly browned, flipping as necessary. *There are affiliate links within this post that we can earn a commission on at no extra cost to you. Want recipes + updates to your email? Add your name to the list! Mmm. This grilled cheese looks so delicious! What a great combination pairing blueberries with brie! I can’t wait to make your recipe! Guava with jalapenos?! Life = changed. Must try that! Oh this is undoubtedly the mother of all grilled cheeses!!! Yumm! OMG I have never made anything like this, but now I want to soon! fruits in grilled cheese sandwiches are just so uncommon but I can see how it fits with the brie cheese flavors. thanks for the great share! I love creating variations of a traditional grilled cheese and this one is so FUN!! I love the color and the pairing! I bet it’s amazing! This is happiness on a plate. Seriously, all of the heart eye emojis! Brie cheese is my absolute favorite and I usually pair it with raspberries but I really love your idea of blackberries. I will be using it moving forward. Thanks for that! I’m sure raspberries would be great with it too! Sign up to get new recipes to your email!